The Series VF Air Flow Capture Hood accurately measures air volume flowing through registers, diffusers and grills. 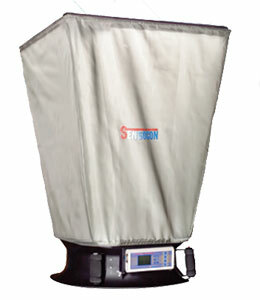 The Air Flow Capture Hood is light weight and is easily handled by one person for measuring supply or exhaust airflow. The large LCD simultaneously displays airflow, velocity and temperature and can store up to 100 readings in a non volatile memory for later analysis. Later analysis of the Air Flow Capture Hood data is easily downloaded to your computer with the included RS-232 cable and software. Each Series VF Air Flow Capture Hood includes airflow measuring base, 2’ x 2’ (610 mm) hood, brackets, RS-232 cable, software, nylon carrying case, batteries, and calibration data sheet.